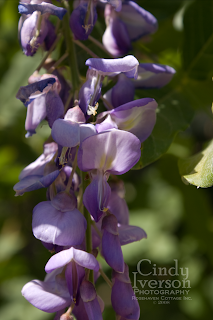 Even though it's a scorcher of day outside, I had to go out and photograph my weird wisteria and share. I don't think I've ever known a wisteria to bloom twice in a year. It bloomed earlier this spring and then I guess it's decided that it's time to bloom again. This is such an odd wisteria. I've had it for over five years and it's only bloomed once before this--in September of 2006. Maybe it's making up for lost time? 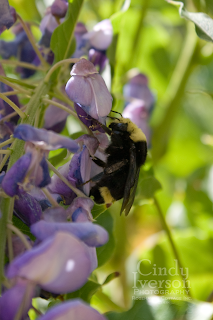 Regardless of the wisteria's weirdness, Mr. Bumblebee seems quite happy at the unseasonable bloom. 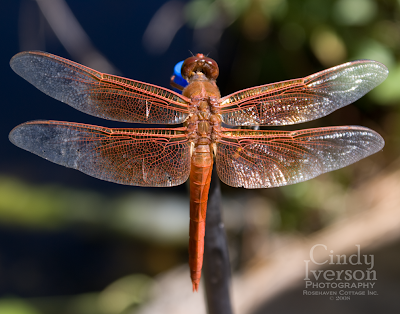 While I was photographing the wisteria, I noticed this gorgeous dragonfly buzzing around the pond. Usually we have more dragonflies than we do this year, so it was a pleasant sight to see. It lighted on one of the drip-mist heads on the edge of the pond and let me get very close for some shots (click on the image to enlarge). The only time it would fly away was when another dragonfly would come flying around the pond. Then this one would take off and chase the other dragonfly away. Once the trespasser was gone, my subject would light on the sprinkler head again. It was quite interesting to witness this territorial display. I'm used to hummingbirds being like this but not dragonflies, as they usually hunt in a cooperative darting canopy on summer evenings over the garden. I sat back in my chair under the plum tree only a foot or two from the brave little dragonfly and watched. Over and over, I would see the other dragonfly come into the pond area. If the trespasser stayed behind a screen of one of the potted plants, my subject would stay content on the sprinkler. But as soon as the trespasser came within my subject's line of sight, it would take off and chase the trespasser away--over and over, again and again. So maybe this is why we don't have as many dragonflies this year. Your wisteria blooms are pretty but that is strange that it bloomed twice this year. Maybe you're right & it is making up for lost time. :) Great shot of the dragonfly. What a bully dragonfly! He does not play well with others! But this is a beautiful photo. I love his little hairs. Great photos. Love the wisteria...weird, but wonderful! It seems to be a good year for Wistaria flowering twice. In my village I've seen several that flowered twice this year and now it has happened to you too. Isn't ti wonderful? Enjoy the gorgeous flowers while you can. Great shot of the dragonfly Cindy! They love ponds, don't they? I do love dragonflies, and dragons as well as crows. Hubby has been experimenting with a new posh lens on his Canon. I'll have to post pics of what it's like compared to what I can do with my normal camera. Ooo That felt good saying "my" -it was the family camera. What great photo of the dragonfly! It's amazing what can be acheived when least expected. what a stunning picture of this orange fellow. i love the wisteria. My purple one bloomed twice this year once this spring and it's blooming now. Treated the white one the same way, but it only bloomed this spring. This is the first year we have had them, so I don't know if this is weird or not. I seem to remember them blooming all the time when I was a kid. You are such an amazing photographer...I hope you put those on card too!! I love wisteria. THANK YOU so much for the cards...they are awesome!! They are too pretty to use...your card was so sweet and I loved your personal message..it really meant a lot to me! How wonderful that your wisteria is blooming twice this year! I bet it is making up for lost time! What a wonderful story about the dragonfly. That is just crazy! How funny! A territorial dragonfly. I hope you're having a happy week! What a great picture of the dragon fly. He is acting like our sweet humming birds which I love watching. Your photos are always so phenomenal! Makes me wish I had a better camera... Anyway, just wanted to say how much I always enjoy your cool shots and your blog in general. It's always a breath of fresh air. Japanese wisteria (floribunda) is blooming twice a year.